Feeling bored with your hairstyle? Perhaps you feel that you’ve fallen behind with the latest hairstyles and color trends. This gallery will soon catch you up to the latest looks in long, medium and short hair with a fauxhawk shape on top! The new hair color ideas range through warm and cool shades, including lavender, purple, gray, copper adding amazing style to brunette and blonde hair, too! So whether you’re seeking a trendy short haircut, a unique daily hairstyle or a knock-out formal/bridal updo – this is the place to find it! 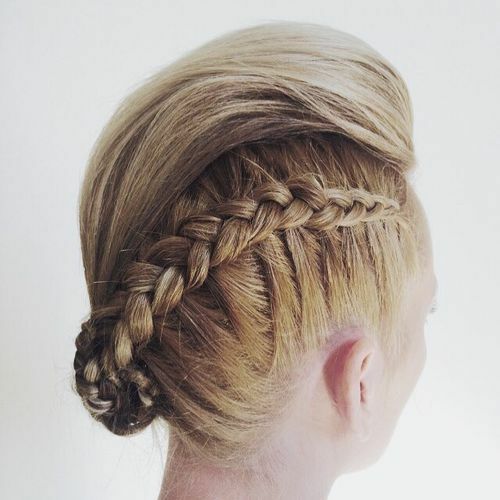 This style is a happy blend of milkmaid braids and vintage eighties curly fauxhawk – plus white-blonde balayage! 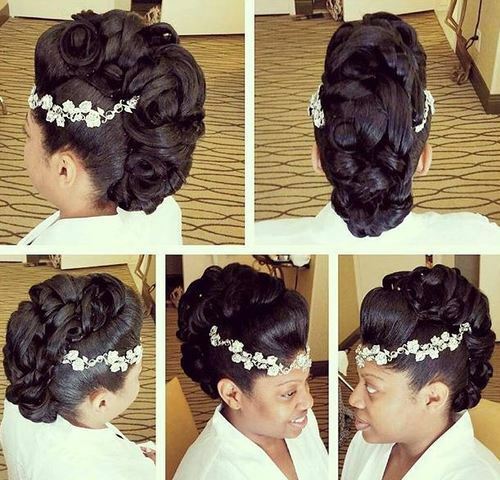 It’s a good choice of bridal style or dinner-dance updo with a casual finish. The sides are lightly bouffant and the curly blonde fauxhawk is bordered by a pretty head braid with dual-blonde balayage! Here’s a lovely party hairstyle for curly hair with cute bangs softening the line. The sides are brushed back in a streamlined look that blossoms into a cascade of curly texture reaching down several inches below the nape. The contrast between black and blonde balayage adds any edgy look to soft ringlet curls! This fabulously textured updo combines sophisticated smooth lines along the top, with the patterned texture of a diagonal side braid. The whole style is set on a diagonal, asymmetrical line that finishes on one side of the nape. With yellow-blonde roots changing into brown and beige shades, the color and movement effects are fabulous! 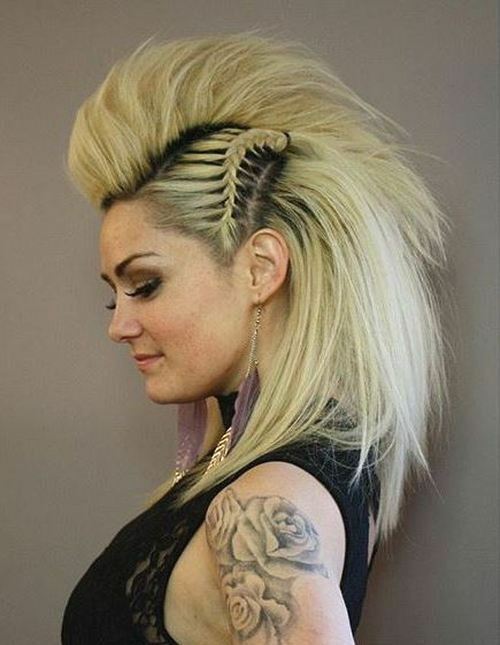 This biker-babe look is definitely an alpha-female look that includes elements of a lion’s mane and a cockatoo crest to underline its dominant vibe! Black roots against platinum-blonde create color depth and a harsh, edgy look. 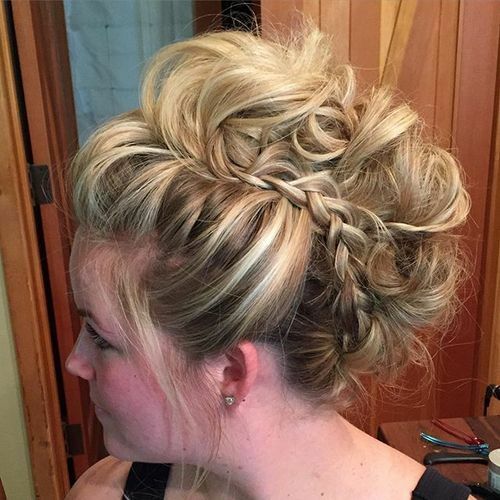 The hair has sharply textured tips creating movement and the lovely side-braid is full of pattern and texture! 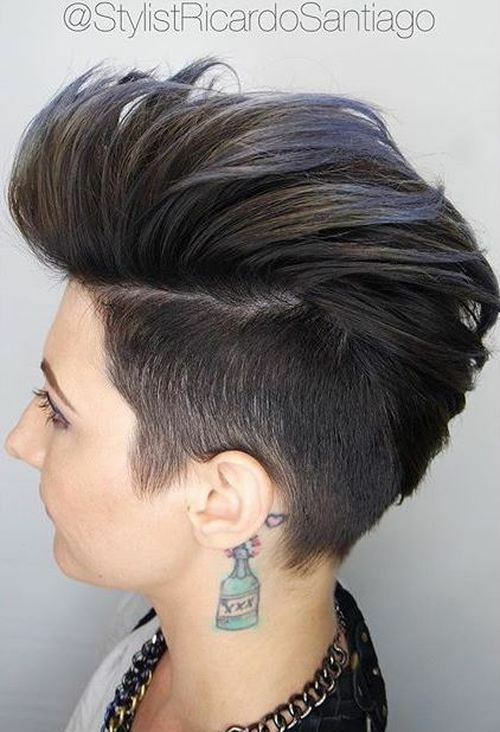 Here’s a strong, confident look for thick hair cut in a fabulous fauxhawk style. The sides are cut very short in a short-back-and-sides shape and the long Mohawk section has sharply textured tips for an attractive tapered finish. 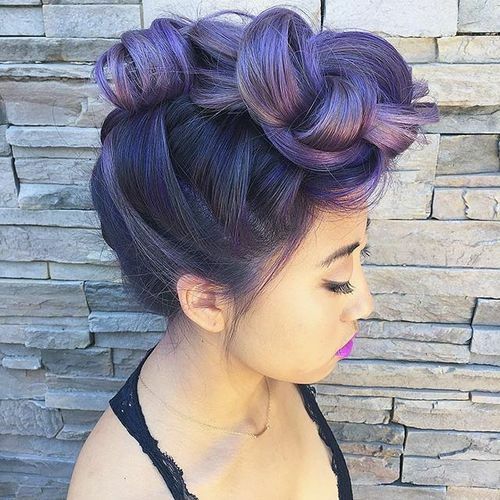 The contemporary twist is achieved by adding gray with lavender tips on the top! 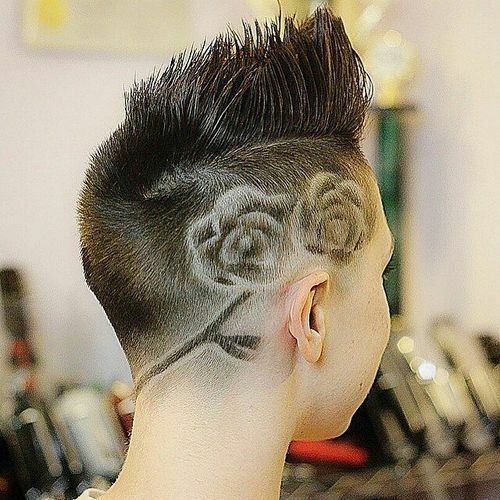 You may prefer to wear your hair in a short, sharp ‘boy-cut’, but you can also add feminine and contemporary pizazz with this unique two-rose pattern! This is an asymmetrical fauxhawk with a gelled top, cut in an angle towards a high-fashion quiff over the forehead. Here’s one of this season’s outstanding fauxhawk/braid upstyles. It’s guaranteed to be a total show-stopper at any formal/semi-formal event! Long black hair has a purple to lavender ombré, which is very loosely braided from the forehead. 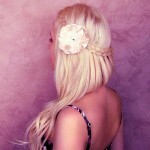 Pinned along the top, this produces an amazing, curvy fauxhawk ending with a curl at the crown! The sides have lovely patterns in lavender, purple and black. 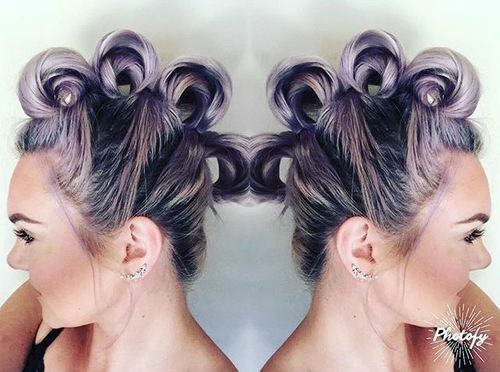 This is a cute, quick and easy hairstyle to do at home and a lovely look in trendy lavender-blonde and black! 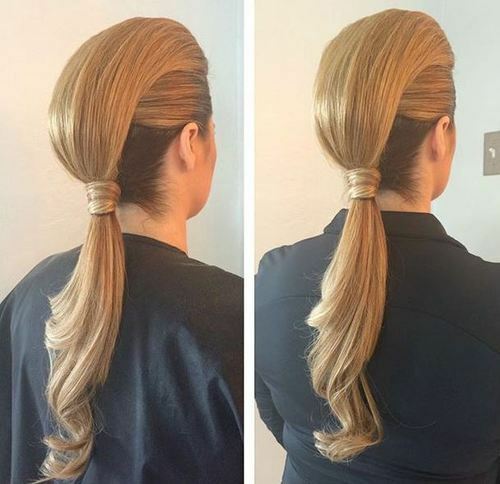 You just brush the top section into two forward rolls pinned to the head and one back roll with a cute, curled pony underneath. Then comb and separate the sides and pin hair up between the rolls! This copper and blonde streaked fauxhawk is arranged in a swept-back look on the top, which changes into a curved D.A. finish at the back. 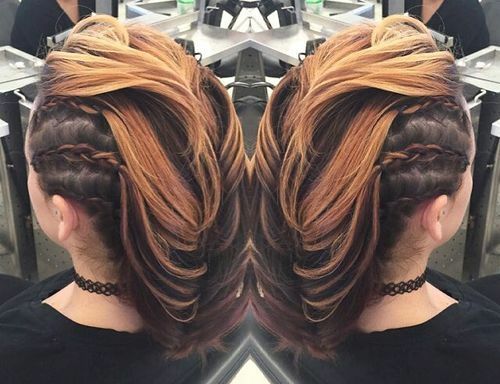 Three rows of thin, head-breads decorate the sides with the orange balayage looking great against a warm brown background! Gorgeous golden-blonde is great for a wide range of ages and skin-tones and with darker roots you get extra color depth and braid patterns. This trendy fishtail braid starts from the forehead and continues to the nape, with a short choppy ponytail decorating the back. Great new look for anytime wear! This semi-formal hairstyle is a great look for extra-long hair that needs a more mature finish. Loose waves don’t suit every age-group, but you don’t have to cut off long, lovely hair as you get older because there are many fabulous looks to try! This style creates beautiful blends and contrasts of color and texture in a smooth, chic fauxhawk ponytail. 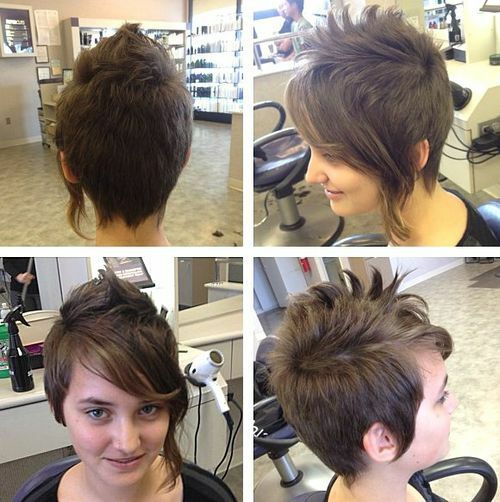 You can try this fauxhawk inspired, trend-setting look anytime on a short asymmetrical haircut. Just use straighteners to make an upward section after you’ve dried the rest of your hair. The trendy lavender color over dark roots highlights the pretty texture of the short sides and back, in a great style for oval, round and heart faces! Prom/party hairstyles have to be super-fresh every season for teens who demand the latest fashions to impress their friends! This is a particularly cute party look with crimped hair braided from the forehead to the crown! The ponytail is also full of texture in varied braids – beautifully highlighted by a soft, golden blonde ombré! 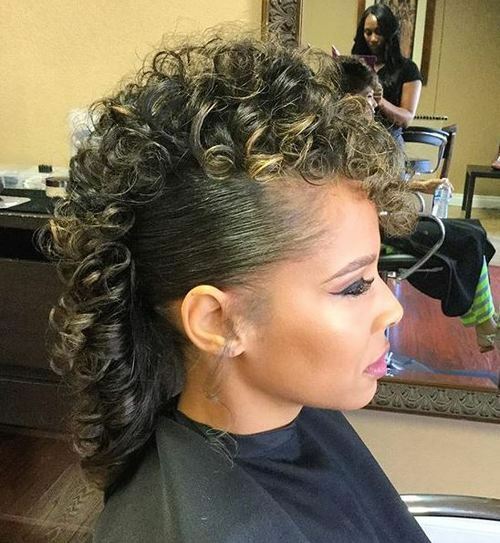 This fabulous style is great for anyone with an extrovert personality! 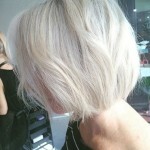 The front is a flattering short bob for a round, oval or heart face. However, the sides are edgy and shaved up around the ears with a clipped, copper margin. 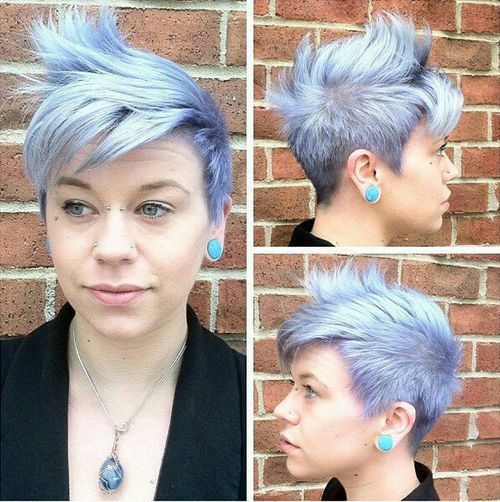 The Mohawk is a fabulous, lavender-tipped plume down to a D.A. at the nape! This fantasy fauxhawk has a high volume, like the original punk Mohican haircuts, but is softened and feminized by the cute, curly bouffant texture! I love the idea of having a braid along one side, which I haven’t seen before. With bangs, this raspberry fantasy look is a great high fashion look for a ‘night on the town’! 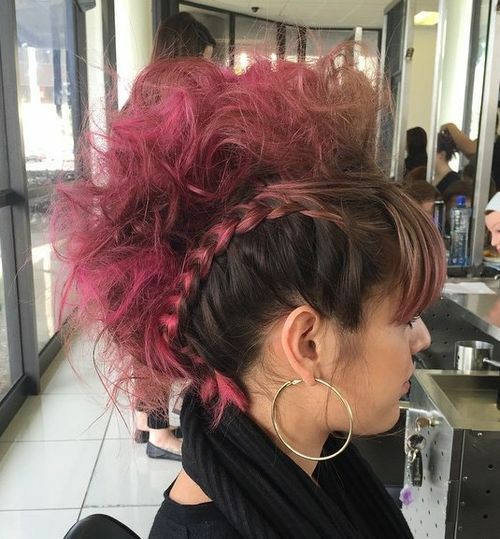 This totally unique half Mohican style has the top braided into an ultra-thick, fish-tail braid. This creates a fantastic ridged texture from every viewpoint! 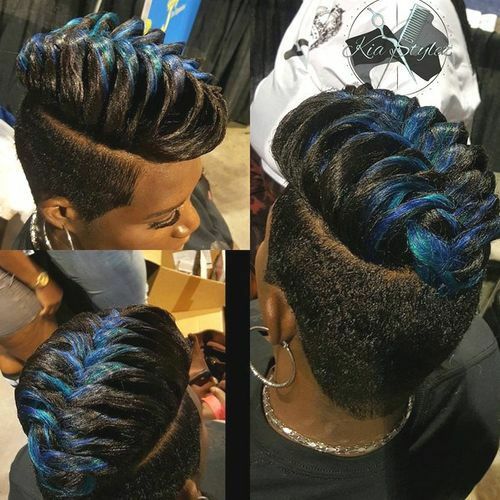 The ‘parting’ moves around the head forming a decorative shaved pattern and a mix of royal blue, aqua and turquoise balayage finishes this high-fashion look! This gorgeous copper style is perfect for occasions when you want to ‘knock the socks off’ everyone around you! Height on top with swept-back sides is a glamorous look that flatters round/wide faces and the beautiful French twist continues the fauxhawk shape. With a loose fishtail braid draped over one shoulder this is a very alluring look! 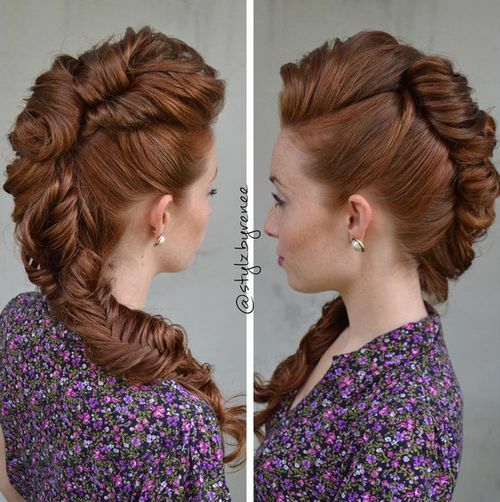 You can wear this braid fauxhawk hairstyle with two braids in lots of different ways. 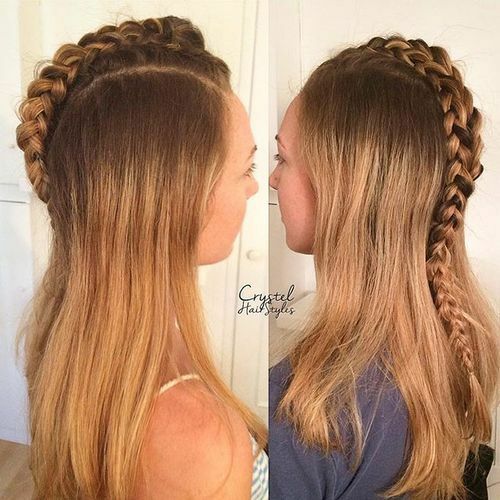 This version is asymmetrical with one long braid from the top to the ends and another reverse braid that moves from the back to finish at the front! Black or dark-brown balayage shows up in the braids highlighting the color and texture! 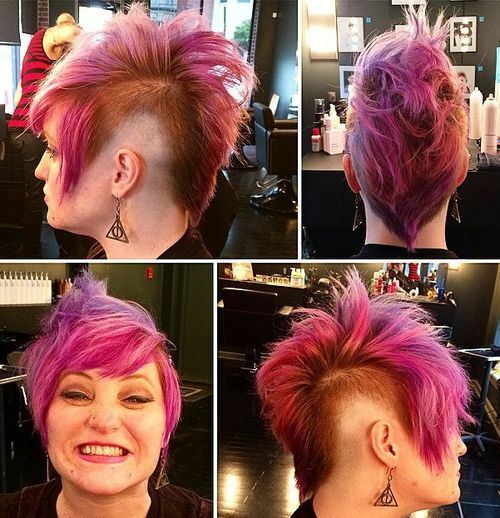 We love this imaginative fusion of ideas that produces four different hairstyle views on a very asymmetrical cut! The back is layered into the neck to finish in three cute wispy pixie-points. The fauxhawk is defined to create a ‘cockerel’s crown’ look, with black lowlights on the tips. And the side-swept bangs are graduated to a long disconnected strand. If you’re looking for ideas to inspire a bridal hairstyle or for a sophisticated formal evening event, here’s a unique and impressive idea! The fauxhawk is created from large curls pinned to the head in a high-volume curve down to the nape. The quiff above the forehead flatters round faces and a pretty, white floral accessory completes the look! So I hope you’ve found plenty of new and exciting fauxhawk hairstyle inspiration from today’s wide-ranging gallery! There are lots of new ideas coming in all the time, and you can see a totally up-to-date and new gallery every few days – right here!